M1000 Double Disc Press Drill - Morris Industries Ltd.Morris Industries Ltd. 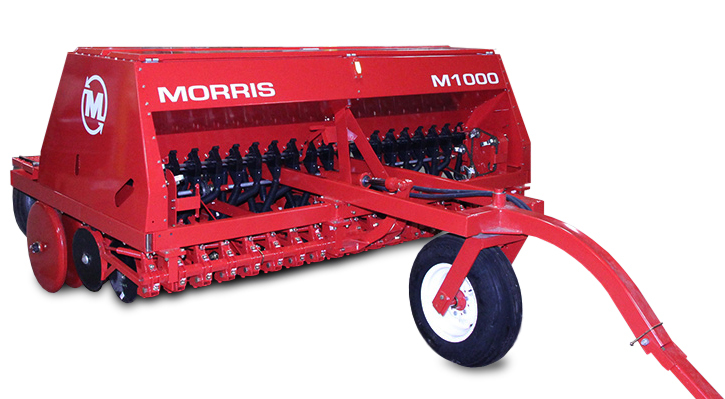 The M1000 is a double disc press drill seeder preferred by farmers who seed into pre-worked, harrowed seedbeds. Seed, Fertilize, and Pack in One Operation. The spring loaded double disc openers are mounted directly to a square tubular rockshaft mounted under the front of the machine and accurately place the seed and fertilizer in the soil at the set depth. An adjustable stop collar on the depth cylinder ensures precise, consistent seed depth at all times. The row spacing is set at 6 inches to fully utilize the seedbed and provide good swath support at harvest time. Adjacent openers are offset front to back by 6 inches to ensure consistent ground following. A 23 inch steel packer wheel follows each opener for consistent soil to seed contact. A three-range variable speed sprocket drive transmission coupled with a unique metering system gives unrivalled seeding uniformity for a wide range of seeds. The simple quick change sprocket drives allows for 7 standard settings in each of the three speed ranges with an additional 23 optional settings available for each range. Two transmissions for seed and fertilizer and are conveniently located on the front corners for easy access. The unique design of the metering system features two stage metering wheels in each metering cup. The small pegged portion of the wheel is for fine seeds, while the spiral fluted portion is for coarse grains and large seeds. The spiral fluted wheel ensures a steady flow of seed that eliminates pulsing at lower seeding rates. Changing from coarse to fine is simply done by turning the metering shaft adjustment bolt to the desired setting. The single bolt adjustment moves all the metering wheels on the shaft at once. Each seed and fertilizer cup features a shut-off to allow for varied row spacing and a collector cup that is easily removed for inspection or cleaning. 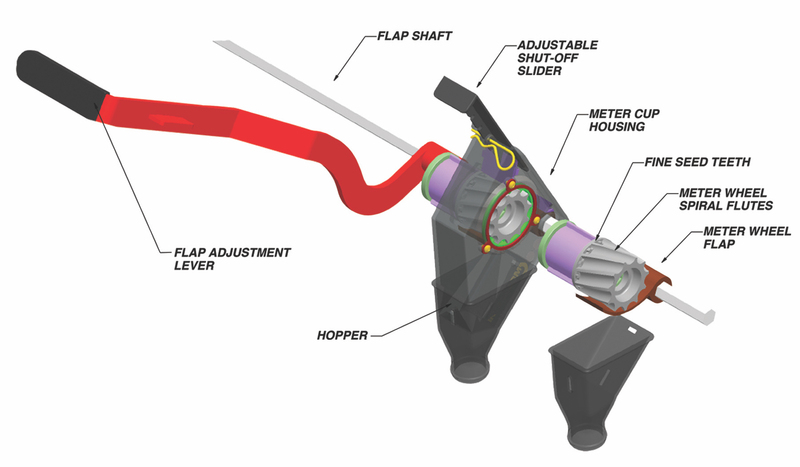 A wrap spring clutch drives the metering system and is protected by a sheer pin in the clutch. M1000 features a two compartment box with individual lids. Front compartment holds 18.4 bushels of seed. Rear compartment holds 990 lbs. of fertilizer or an additional 13.4 bushels. Product level indicators are standard for both compartments. A removable seed box agitator in the front compartment maintains even seed level and helps prevent bridging. Move from field to field safely and efficiently. Large acreages can be quickly and accurately covered by combining multiple units of the M1000. Units from 10-60 feet are available and equipped with quick fold field hitch on units 20 feet and up. Excellent transport stability is assured with two lockable castor wheels for every 10 foot sections. These optional transports make moving from field to field a simple one-person operation. The M1000 comes standard with a 9.5L x 15SL single tire front castor. For softer field conditions an optional 9.5L x 15FL dual tire front castor is available. Options are available to suit your seeding operation. A variety of options for the M1000 include acreage meter, hydraulic wheel markers, multiple hitches and transport tires are available.